Clementine is of a variety of mandarin orange (Citrus reticulata) Also known as the Christmas Orange They are typically juicy and sweet, with less acid than regular Oranges. 1' to 2' Tall (Not Including Root System Height) Upon Receipt,Shipped in a Black Grower's Pot except for California. A Clementine is of a variety of mandarin orange (Citrus reticulata). The exterior is a deep orange color with a smooth, glossy appearance. Clementine separate easily into seven to fourteen moderately-juicy segments. They are typically juicy and sweet, with less acid than oranges. Clementine are also known as "Christmas Oranges" because they tend to bloom the most in the colder months November- January. Great gift for the holidays.Works great as a patio plant. If you live in a cold climate, just bring it inside during the winter. It produces abundantly indoors or out. Just place it in front of a sunny window and pick fresh fruit throughout the winter. 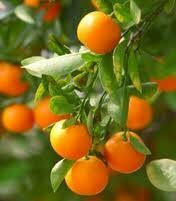 They are very easy to peel, like a tangerine, but are almost always seedless. Clementine are, thus, also known as seedless tangerines. About Fruit Production: Due to the blossoming cycles of Citrus & Fruit Trees we cannot guarantee that any of our trees will arrive with developed fruit on them. Since our trees are grown from grafts of mature trees, they do produce fruit years sooner than a seeded tree would. Usually our trees will begin to blossom and produce fruit around two to three years old. The older a tree is, the more likely it is to produce fruit. Fruit production is seriously effected by the care that the tree receives and also the climate that the tree resides in. With proper care, any of our trees will thrive and produce fruit for many years. Please allow up to 4 weeks as these are ordered directly from our growers to ensure the freshest possible.